We can all relate to the need to keep beer cold, so it stays enjoyable for hours at events and parties, or even just for at a home bar. A kegerator keeps a keg of beer cool while also providing a tap for dispensing drinks. If you’re a beer enthusiast, you’ll want to have one of these on hand, but you’ll want it to be one of the best kegerators available. But how do you choose which one to buy? There’s a good selection of kegerators on the market this year. Some of them have been there for years, and some of them are new models. The price range for these appliances is wide and online reviews are hit and miss. There’s also size and the number of taps to consider, not to mention how stylish they look. So, which is an overpriced dinosaur, and which is a high-quality bargain? That’s the question we set out to answer with this guide. We rounded up the most popular and promising kegerators and reviewed them all to come up with a list of the best choices available. This year, we found seven that met our high standards after a battery of exhaustive tests. Kegerator is a clever combination of the words “keg” and “refrigerator.” Essentially, these are appliances designed for serving beer out of a keg and keeping it cold at the same time. They are often made portable with casters, so they can be wheeled around. They come with all the accessories needed to tap a keg of beer and serve straight out of a draft dispenser. They usually provide a CO2 tank that can be coupled to a keg to help pump beer up to a faucet for serving. Kegerators are favored by beer enthusiasts because they are the best way to maximize beer's shelf life. What Types of Kegerators Are There? What Parts Make Up a Kegerator? What Capacities Do Kegerators Have? What Sizes Do Kegerators Come In? Who doesn’t love a stainless-steel look on appliances? Nostalgia’s KRS2150 is a kegerator that looks great, which makes it a good choice for catering and parties. It’ll impress everyone with its stainless-steel look, but that’s just scratching its surface. The stainless-steel exterior also makes it easy to clean up when things get messy. The KRS2150 has the capacity to fit the 1/2-sized kegs that you’re likely to encounter. The 13-inch tap is user-friendly and spring-loaded, so drinks can be filled quickly when serving a line of customers, and it’s made to last with durable materials and a proven design. Finally, the KRS2150 comes in two different color options (stainless steel and black), so you have some leeway if you need to match a décor. It also comes with a 2.5-pound CO2 tank that straps into place on the inside of the unit and a stainless drip tray that helps with after-event cleanup. The KRS2150 is a stylish kegerator that does the job well enough if you only need a single tap. It’s reasonably priced and has been on the market long enough to work out its bugs. If you need a solid kegerator for events or catering, this one can go mobile on casters, so you can wheel it into place and pack into a truck when it’s time to go. Do you like your beer ice cold? We thought so, and so did EdgeStar. They designed their KC2000 model well. So well, it can keep your keg’s temperature in the low 30’s. It comes in a generic black finish that won’t win any style contests, but who needs a kegerator to stand out in a crowd? It’s the tap that counts, and EdgeStar packaged it in stainless steel. If you plan to have parties or grill events outdoors during hot summer days, this kegerator is a good choice. You also get a 5-pound CO2 tank that will last longer than the smaller tanks you’ll get with competing kegerators, which makes long events easier to manage without the need to swap out empty tanks. It also comes with casters to make it easier to take it to events or position it right in a large arena. The KC2000 is reasonably priced and comes with a one-year parts warranty from EdgeStar to sweeten the deal. The KC2000 does what’s important well: It keeps your beer frosty. 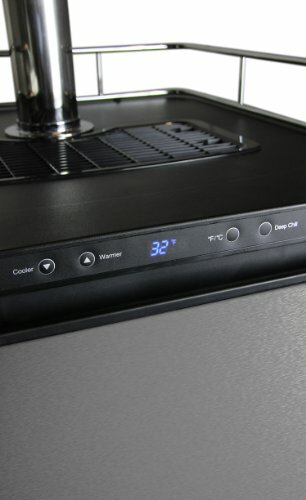 This kegerator can maintain temps in the lower 30’s if you want ice-cold beer out of the tap. It’s also well-priced for its size and quality. Black may not be as stylish as stainless steel, but it works with most occasions. The 5-pound CO2 tank is also a good deal compared to other kegerators. This manual contains important information regarding the proper installation, use and maintenance of your kegerator. Following this manual will ensure that your product will work at its peak performance and efficiency. Please save the original product packaging in case you need to safely transport your kegerator. If you notice the first pint of beer is excessively foamy each time you use a kegerator, consider installing a recirculation fan inside the unit. Do you need ice cold beer and two dispensers? Some events are larger than others, and long lines of empty glasses move faster with a second faucet to serve with. This kegerator features one of the best refrigeration units among the kegerators we reviewed, consistently keeping our beer in the low 30’s if we cranked it to the highest setting. 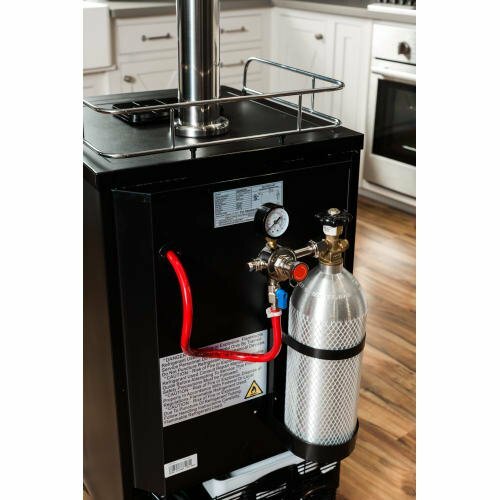 Like EdgeStar’s standard KC2000, it can handle up to 1/2-size kegs and comes with a 5-pound CO2 tank to keep the draft foamy. 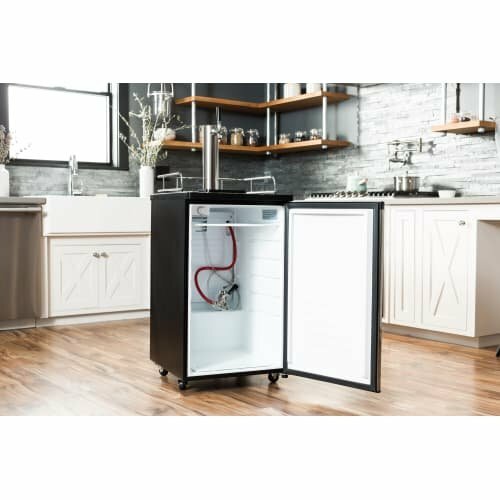 It’s a mobile kegerator that comes with casters, which makes it a great choice for caterers who need a unit to take to various locations and set up quickly. You’ll pay a bit more for the second tap, but you’ll also serve twice as many customers. EdgeStar backs up the KC2000TWIN with a one-year warranty. The KC2000TWIN takes the successful KC2000 model kegerator and upgrades its draft tower with a second faucet. This makes it much handier for serving a thirsty crowd at the start of events. It has all the other winning features of the KC2000, including its excellent refrigeration and caster wheels for mobility. All of this adds up to a great choice if you want to serve more people than you can with the standard KC2000. Need a kegerator that can hold a full barrel of beer? Kegco’s got you covered. 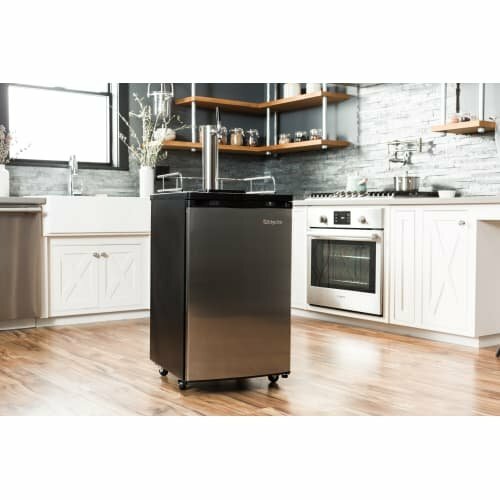 Their Digital Beer Keg Cooler can hold a 1/2-barrel of beer including Coors and Miller kegs, or you can set two 5-gallon kegs into this spacious cooler. It features a pair of faucets that can be fed by two different taps, meaning you can offer a choice of two kinds of beer. The stylish, stainless-steel exterior sports a high-tech digital control panel that lets you set the temp exactly where you want it. The refrigeration unit has a deep chill mode for getting a warm keg cooled down as quickly as possible. You’ll also get a Kegco’s premium keg tapping kit complete with beer lines, D system keg couplers, and a stainless probe approved for commercial use. A five-pound CO2 tank is provided to keep the draft fizzy for long-running events. Kegco’s Beer Keg Cooler is a great choice for commercial use such as catering large events. It has the room to hold large a quantity of beer and a refrigeration unit with plenty of power to keep it cold. It also gives you the versatility to serve two kinds of beer at the same time if you put smaller kegs inside. If you can afford the investment, this kegerator will serve a catering business well. Please make sure to read and understand this manual before use. Want a fridge that can be converted to a kegerator when needed? That’s the idea behind EdgeStar’s BR2001BL. The tap, draft tower, and faucet are sold separately, and you can choose the parts you prefer as long as they fit the BR2001BL’s tower hole. Otherwise, the tower hold can be plugged, and the unit used as a refrigerator. This refrigeration unit can maintain temps in the lower 30s, whether it’s holding a 1/2-size keg or a stack of catering meals. The BR2001BL sports a black on black style that will fit into many different décors, whether it's at home or at outdoor events. It can be fitted with casters, so it can be moved from place to place or follow the action in a large arena. The door is also reversible to suit the spot you want to place it. EdgeStar covers the BR2001BL kegerator system with a one-year parts warranty. This offering by EdgeStar gives you some flexibility when it comes to the tooling you choose to use to convert it to a kegerator, and this is the main selling point for the BR2001BL. If you’d rather outfit it with higher quality or custom parts, this is the unit to buy. It could also be convenient as a home appliance if you won’t need a kegerator very often. You can use it as a fridge in between events. Getting the right amount of carbonation in a draft system is a matter of balancing the amount of CO2 added with the temperature inside the kegerator. Looking for an affordable full-size kegerator that can handle a barrel of beer? The KM2800SS may be the appliance you need. It can accommodate a full-size keg or a pair of 5-gallon kegs. Either way, this full-featured kegerator will keep your beer fresh for up to three months at frosty temps. It’s equipped with temperature controls to adjust for hot days outdoors and cool ones at home. It comes with a chrome guard that will keep glassware safe from falling when you move the unit, while it’s smooth-rolling wheels will help it go mobile without the trouble of a bumpy ride. Keggmeister includes a CO2 bottle, and the KM2800SS is UL-approved for use at commercial events, so it is an option for a catering business or event vendor. 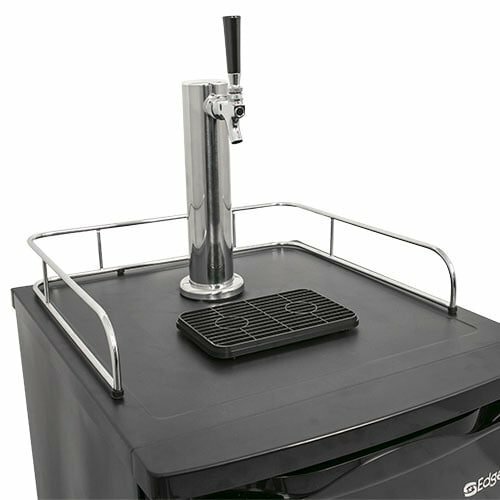 The Keggermeister KM2800SS is a good option for an affordable kegerator that can hold a full-sized keg, but the quality on this unit is reflected in its price. We’d caution against buying this for frequent commercial use. Still perfect kegerator for Guinness. Still, it could be an option if you’re looking for something to use at home where it won’t be stressed. An easy way to discover CO2 leaks is to spray the hookup and tubes with Star San and watch for the tell-tale bubbles. Need a smaller kegerator to fit your space at home? 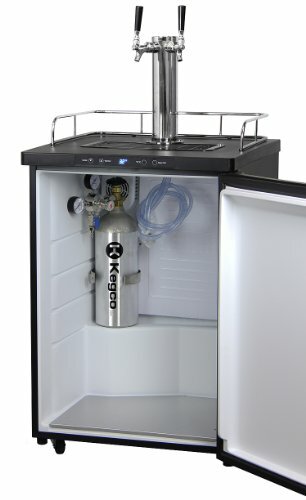 EdgeStar makes a small version of its line of kegerators that can fit into tight spaces. It’s designed for home use and can hold a 1/6-barrel keg and Cornelius kegs. It’s also popular for homebrew kegs, which it can be made compatible with by replacing the coupler with a pin or ball-lock connector. EdgeStar provides a homebrew conversion kit for just this type of project. Apart from its smaller size, the KC1000 comes with many of the same features that have made EdgeStar’s kegerators a successful product line. The refrigeration unit is powerful enough to keep a keg of beer frosty and fresh for months. It comes in a stainless-steel finish that will look great in a kitchen or home bar, and the 2.5-pound CO2 tank that EdgeStar provides keeps the beer carbonated when you turn on the faucet. The KC1000 is a good looking appliance to add to your home bar or kitchen, and that’s its intended use. It’s not designed for commercial use outdoors or for large events, given the size kegs it can hold. It’s a popular model with homebrew enthusiasts, so much so that EdgeStar made a conversion kit to accommodate these types of kegs. We’d recommend this kegerator as an affordable home model with enough capacity for most households. What are the factors to consider when shopping for a kegerator? After reviewing a dozen of these appliances every year, we’ve come up with five things to look for in a kegerator. How those five things stack up for you depends on your needs and situation. Whether you’re looking for a kegerator to enjoy draft beer at home or you have a catering business and want to offer beer at events, there’s a kegerator designed for it. Of course, the first thing to consider is your budget. Kegerators are not the cheapest appliance to buy, costing a bit more than a general use refrigerator. Buying a kegerator means you will need to make space for another appliance. Chances are, you have space if you’re shopping for something to keep a keg of beer cold, but that space varies from buyer to buyer. Every beer has a sweet spot regarding the temperature it should be kept at, so a kegerator that offers precise temperature control is a plus. How much beer do you need to have on hand? The answer to that question will tell you how big of a keg you’ll be storing, which also determines the size kegerator you need. Do you need a kegerator that can be wheeled from room to room or one that can be taken outside and brought back in? You might be better served by a portable kegerator that rolls on wheels, if that's the case. These are kegerators designed to hold mini or 1/6-size kegs of 2.5 to five gallons of beer. They can be counter top or portable units on casters, and they usually have a single draft dispenser. They are best suited to home use when there’s not enough space for larger units. Full-size kegerators are designed to chill a full-size beer keg, which holds around 15 gallons of beer. They are usually equipped with wheels to make them portable, and they often can serve from two mini kegs with separate faucets for each. You can also find commercial-approved portable kegerators that range in size from mini to full-size that are designed for catering or vending at events. There are kegerators designed to be installed under a bar counter with faucets inserted into the countertop or in the cabinet for convenient serving. These range from single-keg units to units designed for commercial bars that can keep a bank of several full-size kegs chilled. They can range from single-tap designs to three, four, six, or even eight-tap kegerators. These are appliances designed to be exposed to the elements. A little rain won’t ruin them, but don’t leave them out in a downpour. The main design feature that makes them outdoor appliances is better refrigeration for hot summer days that can tax kegerators designed for steady indoor temperatures. Faucet: The faucet is the dispenser, usually mounted on top of a kegerator. They commonly have a spring-loaded design that simply needs to be tilted to turn on and let go to turn off. Regulator: This is a device that controls the release of a gas from a pressurized tank. For kegerators, the regulator is used with a CO2 tank to control its release of pressure. Pump: The pump is the device that draws beer out of a keg tap using either a mechanical action or CO2. CO2 tank: Many kegerators come with a CO2 tank to use for a beer keg tap, or you can get one to add to your setup if it doesn't. They can range from small bottles to five-pound tanks that last a long time before they need to be refilled. Tap: The tap is the line into the keg that the beer flows through when you dispense it. Most kegs are designed with a tap port of a particular style, so it’s important to use the right tap kit, which can be an issue if you buy imported kegs. Tap handles may be plain or with some fancy decor. Temperature controller: This is the control that you use to set the temperature of the kegerator. It functions the same as a refrigerator temp controller. It usually consisting of a dial inside the kegerator or a digital controller on the outside of the unit. Thermostat: This is the device that senses the temperature inside the kegerator and turns the compressor on when the temperature is higher than the current setting. Caster wheels: These are mounted on the bottom of some kegerators to make them portable. 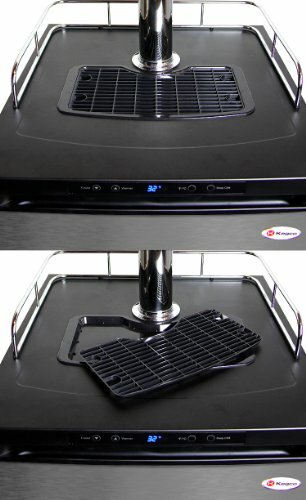 Drip tray: They are convenient to place under the kegerator’s faucet to catch excess beer that spills. It makes cleanup easier. What kinds of accessories do kegerators come with? 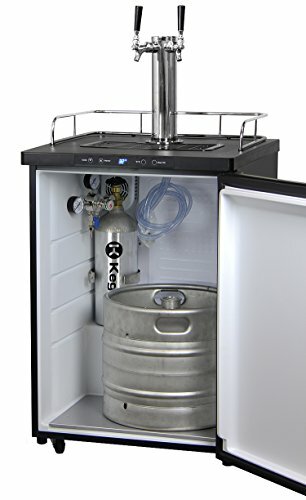 Most of the accessories you can find for a kegerator involve the keg tap kit or the draft tower. You can buy aftermarket kits and products to replace the parts that a kegerator ships with. Most of the sizes are standard, which makes them interchangeable and it helps a lot if you use a DIY kegerator. Tap kits are available for different styles of beer keg, like homebrew kegs, domestic brand kegs, and import beer kegs from Europe. The top choice here is Kegco BF EBDCK-5T Deluxe Door Mount Kegerator Beer Conversion Kit. Each has a different type of tap, so if you drink a variety of beer brands, you may want to collect a set of tap kits for your kegerator. Kegerators come in sizes to accommodate every type of beer keg on the market, so the kegerator to buy is the one that matches the kegs you want to store. The most common size kegerator for homeowners stores a half-size pony keg, which holds a quarter of a barrel of beer. From there, you can get smaller kegerators or rental kegerators that can hold a couple small kegs. These are typically five or 2.5-gallon kegs. This allows you to set up a dual-faucet kegerator to serve two kinds of beer by hooking up each faucet to a different tap line when you put together your kegerator’s tap assembly. Kegerators come in a variety of sizes ranging from large under-the-counter units that can hold a bank of beer kegs to mini kegerators designed for the smallest size kegs at home. If there’s a place where people want to enjoy cold, draft beer, there’s a kegerator designed for that setting. Full-size portable kegerators have room for a full-size keg that holds a half barrel of beer or a couple smaller five-gallon or 1/6-size kegs. Full-size kegerators will sometimes have two faucets, so you can serve two kinds of beer. The other common size of kegerator you’ll see for consumers are mini kegerators, which are designed for home use. They’ll be large enough to hold a five-gallon or 1/6-size keg, but that’s about it. Homebrew beer enthusiasts like to get these kegerators to store and enjoy their own home-made beers. Mini kegerator kits are usually portable and roll from place to place on wheels. Udercounter kegerators can hold one or more kegs, and some are designed for bars to serve a variety of beers from multiple faucets. They are installed as fixed appliances with faucets mounted above a countertop. 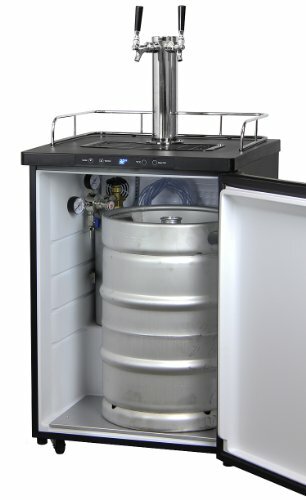 The smaller versions of these kegerators can be suitable for home bars that only need to chill a single keg at a time. Nostalgia, Igloo, Edgestar, Insignia, Perlick. Cleaning a kegerator whether it's made for beer or wine is not complicated. You clean the interior the same way you would a refrigerator. You can empty it and wipe it down with a gentle cleanser. You should also take time to clean the tap line and faucet of beer residue after using a kegerator. You can find cleaning kits with special tools and cleaners to make it easier. You’ll need to refill the CO2 tank regularly and inspect the locking tap and faucet periodically to make sure everything is in working order. Apart from cleaning and replacing worn parts, you might also encounter maintenance issues that kegerators have in common with refrigerators. The circulation fan might fail, or the thermostat could have problems maintaining the temperature in the unit. It depends on the size of the kegerator, as you might imagine. These are essentially small refrigerators designed to accommodate kegs of beer, so they weigh about what you would expect for those appliances. Small kegerators can weight about eighty pounds empty while full-size kegerators can top a hundred pounds. But how portable are kegerators? Many kegerators come equipped with casters or fixed wheels, so they can be moved over smooth, level surfaces easily enough. If you want to set one down in a dedicated spot in your home, you just need to lock the casters or remove them. For caterers, kegerators can be convenient because they’re light enough to move by truck and have wheels to roll over level ground to an event site. Kegerators are refrigerators, and so noise can vary quite a bit depending on the compressor and fan design chosen by the manufacturer. Like refrigerators, you can find high-quality models that make very little noise while they keep their contents chilled, and others can be noisy enough to be an irritant in an otherwise quiet environment. The level of noise these appliances make is a matter of aesthetics, though. None of them make enough noise to harm your hearing. A warranty is a promise by a manufacturer to pay for repairs for a certain amount of time after you purchase their product. For appliances like kegerators, this is often a one-year parts and service warranty, meaning that the warranty will cover both replacement parts and any repair service bills you incur to get your appliance operating again. Note that warranties usually stipulate that a repair only qualifies if the product was being used as intended and broke down because of poor workmanship at the factory. Accidents and creative uses that result in a faulty product won’t be covered. Warranties can be a way to gauge how often a manufacturer expects their product to breakdown. A longer warranty suggests they are confident in their workmanship. What type of coupler do most kegerators use? The standard type of coupler that’s used with beer kegs in America is the Sankey “D” system, which fits most domestic beer brand kegs. However, if you’ll be buying imported beer kegs, you’ll want to research the type of coupler they use, as it’s likely to be different. German brands will use an “A” type coupler, and other European brands use “G,” “M,” and “S” type couplers. What’s the best temperature to store beer at? The best temperature for storing and serving beer is between 36 and 45 degrees Fahrenheit. Beer will freeze at temperatures colder than distilled water, some as low as 27 degrees. It doesn’t really matter which type of beer you have, but keep in mind that lite beers freeze at higher temps. Which of these kegerators is the best? Which kegerator is right for each person is dependent on many factors and the use that it’s intended for. If we had room, we could break kegerators into several categories, such as commercial vs home kegerators or portable vs built-in kegerators. As it is, though, we devised a rating system for these reviews that takes several factors into account to level the playing field. So, which kegerator was it that came out on top for us? For our review, the best kegerator was the EdgeStar KC2000. This kegerator won out because of its reliable refrigeration, which at the end of the day is what these appliances do: They keep beer cold. Many other models seemed to have quality issues that held them back from the blue ribbon. 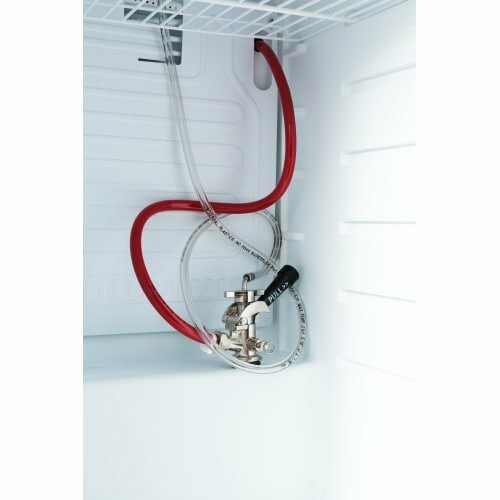 The KC2000 isn't the largest kegerator on the market, but it’s a reasonable size for a home appliance, and EdgeStar provides alternate tapping kits for homebrew or imported beer kegs. All of that adds up to a win in our book.